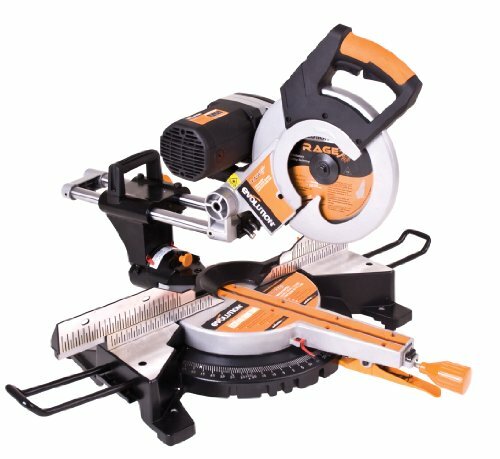 The PORTER-CABLE PCE700 14" Chop Saw features a 15 Amp, 3,800 RPM motor with replaceable brushes which provides power and durability. The quick-release material clamp allows for easy material cutting and removal, and a cutting fence with miter adjustment allows up to 45 degree angles to be cut. 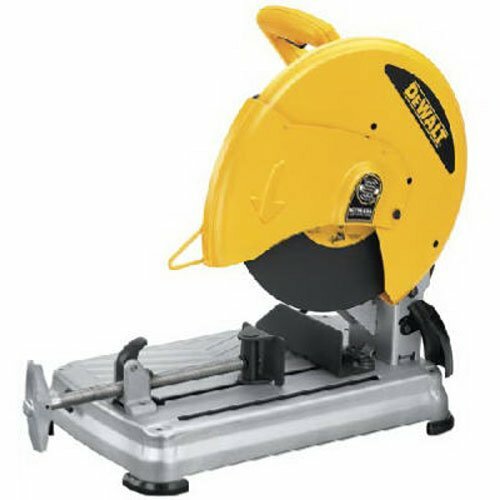 It offers a spark deflector that provides safety and clear line of sight for cutting, along with a heavy duty steel base to provide stability while cutting. It also has a spindle lock for easy blade changes. 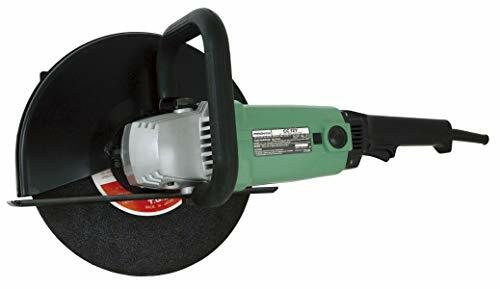 Specs: Blade Diameter: 14", Arbor Size: 1", Wheel Diameter: 14", Power Cord: 8ft, Max Capacity (Round): 4-3/4 x 5-1/3". 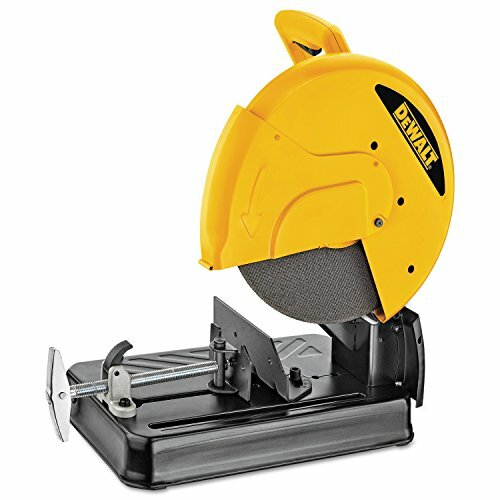 The Item is DEWALT D28715 14-inch quick-change chop saw. Used for hand tools & tool organizers, handsaws. The product is manufactured in china. Featuring a heavy-duty 15 amp motor that delivers a no-load speed of 4,000 rpm. 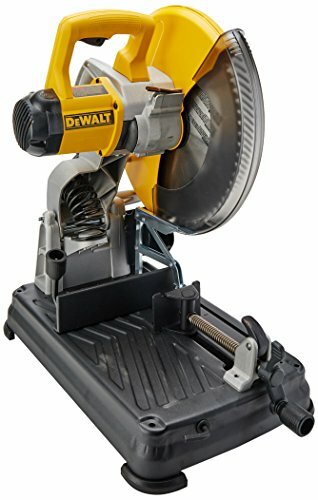 D28715 DEWALT 14-Inch Chop Saw, 14-inch abrasive wheel, fence wrench, and tool-free flange system. The Quick-Change blade change system allows you to change wheels without a wrench. 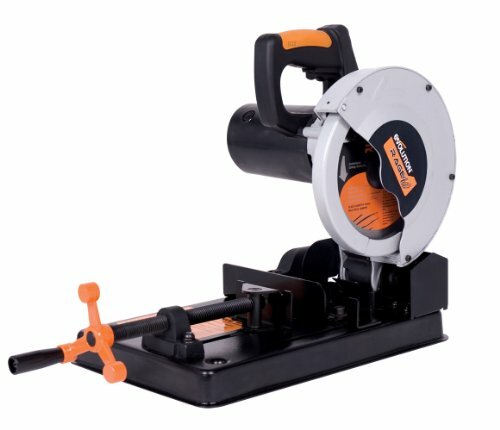 14 4HP max AC/DC Chop saw contains a high performance 15A motor delivering 3800 RPM ideal for a variety of applications. Manufactured with a 1 Arbor and designed for cutting 5 round or 4-3/4" x 5-1/8" rectangular stock. 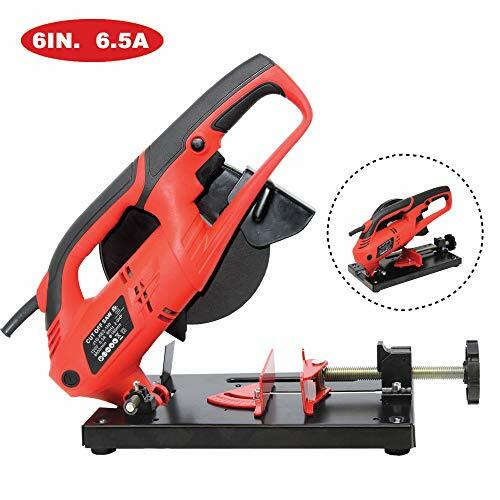 Features a horizontal handle, Quick Lock vise, 0 to 45 degree fence, adjustable spark guards, Spindle Lock, chain style Lock down and an integral carry handle ensuring a hassle-free operation and professional looking results. Compatible with type 1 cutting wheels. Product includes blade, wrench, 14 x1 wheel, 1 year free service, 90 day money back guarantee and 3 year warranty. 458-LC1230 Features: -Long lasting carbide tipped blade for cost efficient, clean and accurate cutting. -Virtually burr free. -Lock-off button prevents accidental starting. 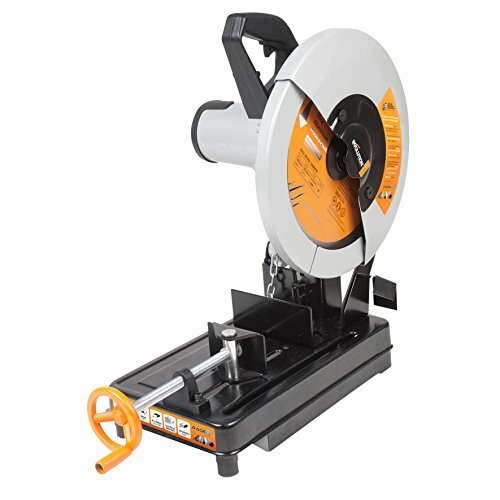 -''Tool-less'' guide plate adjusts 0 - 45 for quick and easy miter cutting. Application Material: -Metal. Power Source: -Electric. Blade Included: -Yes. Voltage: -115 Volts. Maximum Amperage: -15. Generic Specifications: -Voltage: 115.00 VAC. -Cutting Cap. : 4 1/2 in (90 crosscut) [Max], 3 1/2 in (45 bevel) [Max]. -Frequency: 60.0 Hz. Generic Dimensions: -Width: 20 1/4 in. Dimensions: Overall Width - Side to Side: -20.25 Inches. Blade: -Yes. Overall Product Weight: -38 Pounds. Blade Capacity: -4.5 Inches. Blade Length/Diameter: -12 Inches. 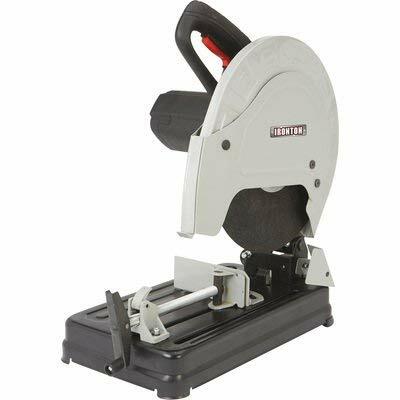 Evolution RAGE 3-DB, 10-Inch, TCT, Multipurpose Double Bevel Compound Sliding Miter Saw is capable of cutting steel, aluminum, wood with nails in and plastic with just one blade. With the double bevel facility, the need to re-adjust the work piece is significantly reduced. The RAGE 3-DB includes a 12-5/8-Inch slide for long-angled cuts, a large base for extra cutting stability and laser guidance for optimum accuracy. wheel guard ensure operating safety, and quick release clamp provides easy operation to increase productivity. 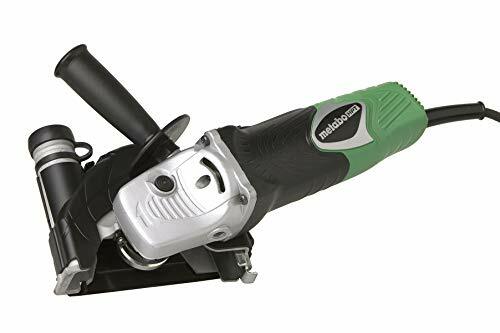 MULTIPURPOSE CUTTING: Patented multipurpose cutting technology allows you to make compound miter cuts in mild steel, aluminum, plastics, and wood; with the included blade. MINIMAL SPARKS, BURRS & HEAT: Cut through 6mm mild steel with no heat, no burrs & virtually no sparks, leaving an instantly workable finish unlike alternate methods. 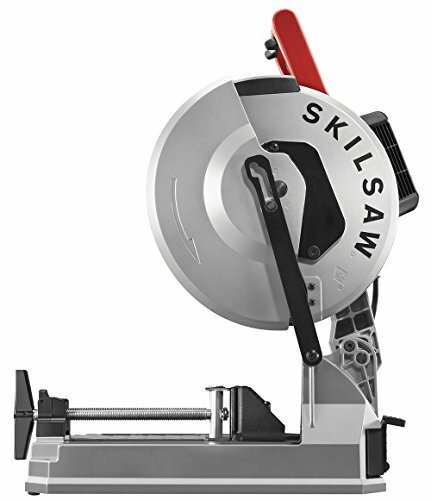 SIMPLE & ACCURATE MITER CUTTING: Features a 45 degree L&R miter system with 9 positive stops. A 0-45 degree bevel tilt, allows for bevel cuts and compound cuts. SLIDING MITER CUTS: Slide mechanism allows for 90 degree cuts of up to 11-13/16 inches wide and 45 degree cuts of up to 8-1/4 inches wide. Comes with laser guidance for optimum accuracy. TUNGSTEN CARBIDE TIPPED BLADE: Comes with an ultra high grade 28 tooth tungsten carbide tipped blade, allowing you to make miter cuts through wood, mild steel, aluminum, and more. 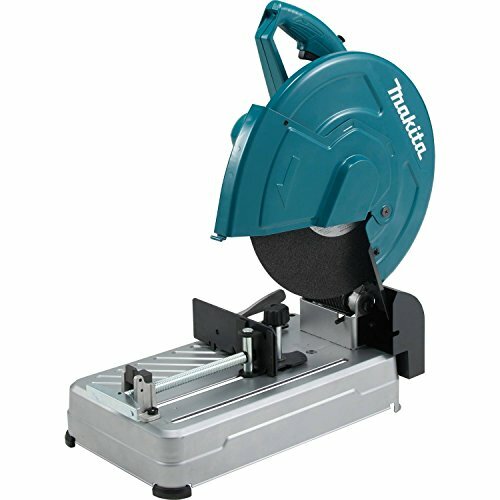 RELIABLE CUTTING: A high torque motor and optimized gear box make this a powerful and reliable compound sliding miter saw. 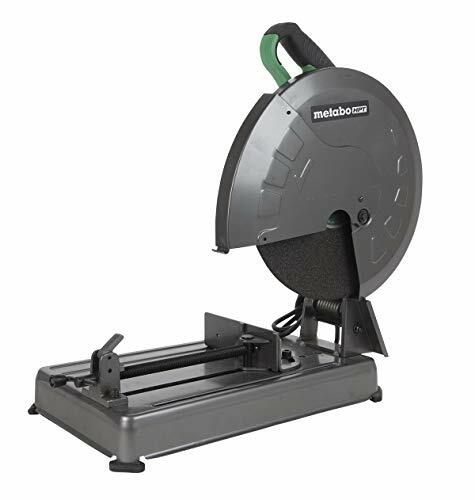 ADDITIONAL VERSATILITY: A full range of blades is available (sold separately) to turn this saw into a sliding tile cutter and to allow for more specific metal cutting applications. Neiko Air Saber/Body Saw Made of durable aircraft-aluminum, Soft grip handle helps keep saw comfortable and in place, Lever throttle control for accurate precision control of speed. Evolution RAGE 4, 7-1/4-Inch, TCT, Multipurpose Chop Saw is capable of cutting steel, aluminum, wood with nails in and plastic. 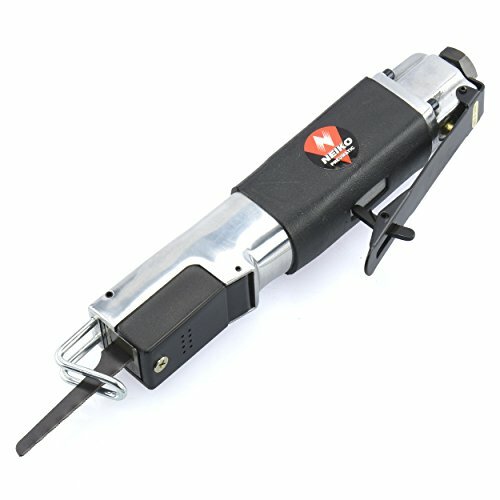 This award winning machine is the perfect tool for slicing through rebar, bolt trimming and other small awkward applications. Plus it has the ability to cut through 2 by 4 planed lumber and reclaimed lumber with nails and screws. This saw is an essential tool to any tradesman. Makita EK7651H 14" MM4 4 Stroke Power Cutter Automatic engine decompression valve is engineered into the cam gear to reduce pull start force by 40% Five-stage, foam-paper-nylon filtration system with advance direction air flow provides cleaner air for better engine durability Integrated wheels reduce fatigue during long straight cuts and retract when not in use to prevent unexpected movement Clear primer bulb facilitates fuel delivery to the carburetor for easier cold starts pressure compensated carburetor with vented choke plate is engineered to reduce flooding by automatically adjusting to deliver the proper amount of fuel Advanced oil separation and lubrication system to improve valve train durability and engine life. Our specially treated rods, followers and valves minimize wear and extend engine life. It has a single lever on-off-choke operation switch for operator convenience. The shielded exhaust outlet and larger spark arrestor screen prevents contaminates from restricting air flow. The external fuel tank vent eliminates pressure build up sealed cartridge recoil starter rope reduces wear by keeping out dust and debris. The cutting arm easily changes from center position to flush (outboard) position allowing cuts directly adjacent to curb edges, wall or directly above the ground. The cushioned operator grips with 4 vibration-absorption rubber buffers for increased operator comfort. It has a convenient oil level check and easy oil maintenance for longer engine life. There is easy access carburetor for more convenient repair and maintenance. The replaceable tank fuel filter is easily accessible without special tools. The included water kit with quick release attachment is adaptable to most common hose threads. Note: Blade sold separately. 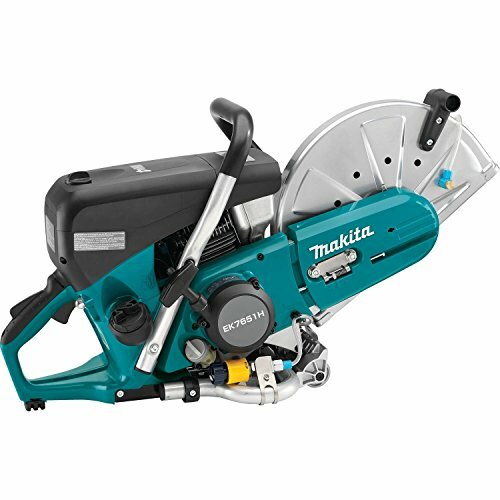 The Makita 14" Cut-Off Saw (LW1400) is a metal-cutting solution built for light gauge metal stud and strut, pipe, all thread, conduit, tubing, rebar and more. The LW1400 features an extra-large spark guard and a "tool-less" flange removal for faster blade changes and ease-of-use. The 15 AMP motor delivers 3,800 RPM for the most demanding metal cutting applications. It is engineered to cut up to 5" round stock, 4-11/16" square tube and 4" x 7-5/8" or 2-3/4" x 9-1/8" rectangular tube. It also features two "tool-less" adjustment features including the fence (45 degrees right or left) and vice adjustment for increased productivity. The LW1400 weighs only 37.9 pounds with a locking pin that secures the cutting head in the down position for easy transport and storage. Additional features include a large ergonomic handle and two-stage lock-off power button. Kawasaki Tools by Alltrade Tools LLC is a global leader in the design, manufacturing and marketing of tools and shop equipment. Founded in 1979, the Long Beach, California based firm is privately held, with global manufacturing and sales facilities serving customers on every continent. The company's mission statement: Alltrade designs, markets and supplies tools and shop equipment that meet and exceed our customers' expectations of quality, service and value, while achieving profits to ensure the Company's and its employees' future growth and development. Alltrade offers our customers innovation, flexibility and speed to market. Ergonomic D style handle with soft grip offers comfortable grip. Full wheel guard,Convenient trigger witch with lock-off button. 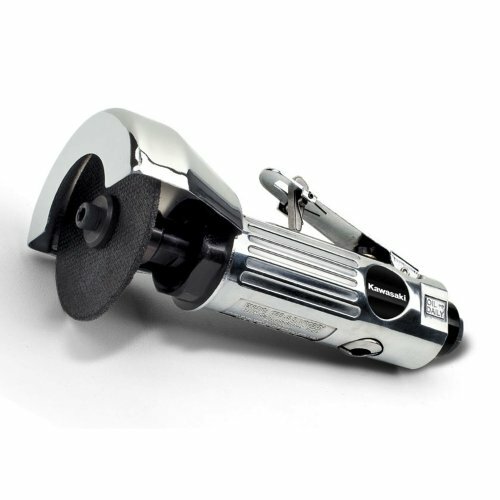 Quick release clamp provides easy operation,shaft lock for easy wheel changes. Strengthened base with thicker steel guarantees stable and accurate performance. 100% cooper wire motor produces rotation speed of 3700/min and great cutting efficiency. 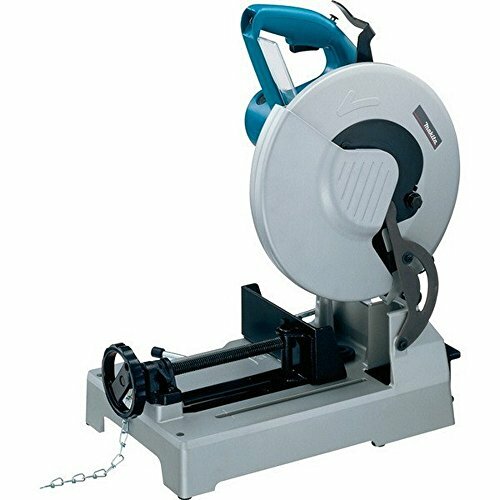 The CC12Y 12" Cut-off saw cuts sheet metal, concrete, cinder blocks, bricks, reinforcing rods, concrete wire mesh, corrugated floor and ceiling forms. The CM5SB is designed for tuck-pointing, cutting, and grooving concrete, tile, brick and Block. 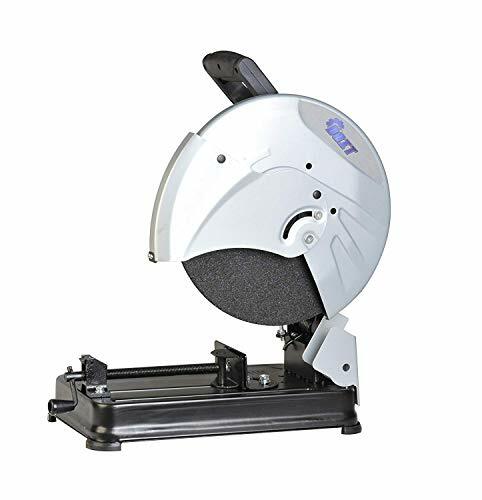 The CC14SFS 14" Portable chop saw is built to tackle the toughest materials. With a powerful 15 amp, 2, 000 watt motor producing a no-load speed of 4, 000 RPM, It cuts through pipe, rebar and shaped steel with ease. A quick-lock/release vise provides for fast changing of materials, while a simple adjustment allows Miter cuts up to 45 degrees in either direction. It's light weight, compact size and large cut capacity make the CC14SFS both portable and versatile. 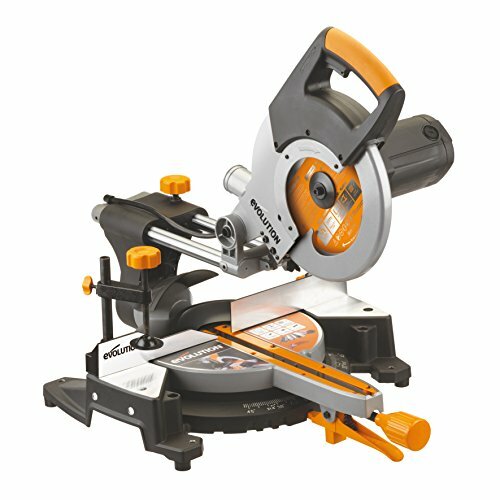 This compact 6.5A amp cut-off saw makes short work of small stock and individual pieces. Features include a blade guard, a miter clamp with a 45 degree capacity and a vice jaw that holds square or round stock securely for cutting. 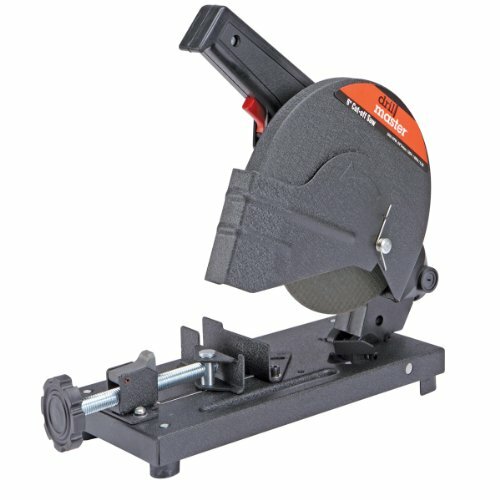 This cut-off saw is perfect for DIY projects and professional jobs alike. Amp: 6.5A . 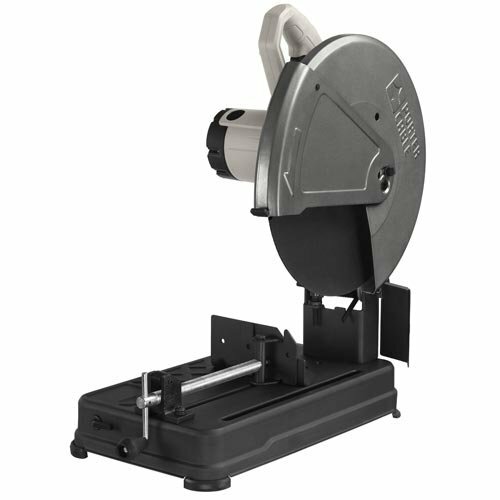 Voltage/Frequency: 120/110V-60-50Hz No-load Speed: 8800rpm Cutting wheel diameter: 6"
The Ironton 14in. Abrasive Chop Saw has the power to easily cut through cast iron pipe, angle iron, threaded rod, conduit, square tubing and more. 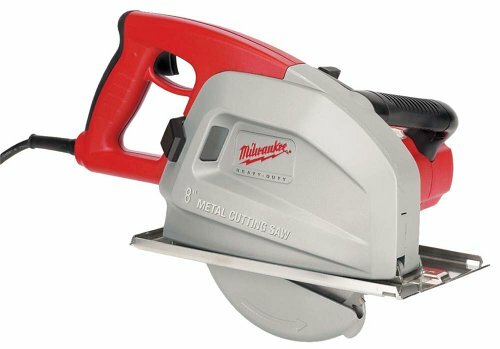 Powered by a 6.5 HP, 15 Amp, 110V motor, this saw can cut 4in. round or 3 1/2in. square stock at angles up to 45. Cuts round rod up to 4in. dia., square bar stock up to 3 1/2in.